My main interest is restoring vintage watches and the restoration of the case has always been a story by it self. Buffing out scratches is "easy" but you often end up with a case that has rounded corners and in worst case - a watch with a somewhat deformed case. I also used different methods for getting the brushed surface back om cases and the worst one - the sun burst was made using a simple jigg - alot of patience and time! As a mechanical engineer I love machines, and it was time to get a new one for the work shop. My first go was using a disc sander as base and building a fixture for it. Hooking it up I noticed that the disc was not spinning as I wanted - time to measure the "wobble"! 0.25mm difference along the edge of the disc - not good! Getting the disc lose was a mission in it self - but with a homemade "puller" I finally got it off! Got it set up in my lathe (had to cut it down to 10" as this is the maximum diameter my lathe can handle) and got the surface within acceptable values. Last edited by McGyver; 4th February 2015 at 14:07. Made a simple "cradle" for the table that could be attached to the disc sander so the disc and table had the same reference point. The result of the initial tests using an old case . The case has been polished MANY times during its life => I had to remove alot of material to get a flat surface again! There was to much "wobble" and I had to compensate for it by hand - time to see what could be done. I got the motor axel out and put it up in the lathe - made some adjustments and put things back together again - still wobble in the disc! After many hours making new discs, adaptor etc. I finally gave up and went for something different. made a new disc with a sutibla adaptor for the mill. Things set up for a first test of this configuration. The test object this time - an old Seiko that has been polished so you almost have to use a microscope to se the remains of the original sunburst brushing! It's a 12" disc with a homemade construction for the bearings powered by a 40V DC-motor. Initial tests show that the disc now turns much smoother and controlling the rpm with the voltage for the DC-motor + the dimensions of the belt drive shows potential. Wow! You need to stick around here McGyver, proper bodging skills on display! Really enjoyed reading the above. Love the skills and the tools. Brilliant! Looking forward to the continuation. Good stuff. Some proper McGyver ingenuity going on there. The finish looks excellent. Very impressive work and a lovely finish. That old Seiko looks great. Very impressive skills there sir!!! The case is presented to the spinning disc at 270deg as close to the edge as possible and at the horizontal center using the table for the right "tilt". My "chuck" can rotate and the case is then rotated 360deg to achieve the sunburst pattern. As the length of the case in contact with the disc is so short the brushing will be almost straight, but it will NOT be perfectly straight! Many thanks. I think I get it. Does the case remain in contact with the disc while you rotate it? Yes - the case is rotated and has contact the whole 360deg! If you look at the STS video (40s -> ) you can see how it's done! Last edited by McGyver; 5th February 2015 at 12:56.
excellent thread,most interesting and enjoyable.thankyou. Forward to seeing some more case refinishing ! Engineering initiative at it's best! Building a lapping machine never crossed my mind...until now. I really like your approach to things! Great post! Very impressive, I want one! Thanks all - have made some new parts for the belt drive - will post pictures when I have them fitted! Right now I'm thinking about a sutible setup for the table so that the hight can be adjusted. I got mine from Conrad.de - It's from Proxxon and quite easy to find - at least here in Sweden! Excellent work there OP. Re the Proxxon slide table, we discussed them a while ago in the Digital Photography section with a view to adapt to take a camera mount in order to take a series of macro photographs to be stacked for great depth of field.They were pretty widely available, and allow for very fine adjustments, measured in microns for macrophotographic use. I never got around to buying one as something else took my attention............. and my ££££s! New wheels for the transmission made. First try lapping a case with the machine! I don`t have the skills or equipment to build something like this, but I`d be interested in buying one. It would be helpful for me to have this capability. Depending on the watch, I can do sunburst finishes quite well using the edge of a coarse Garryflex block, but the lapping machine will always be the best way. It shows what can be done with a bit of thought and improvisation, I`m v. impressed. Last edited by walkerwek1958; 10th February 2015 at 23:19.
excellent post and the results look very impressive. Great post and a brilliant bit of engineering. I've done some minor modifications to the setup with a "help wheel" to make the disc more stable and flex less . I have also ordered new sandingdiscs with 120, 240 & 320 grain (carborundum) as the silicon ones I have (finer grain) tend to leave residue that makes the surface look a bit sandblasted. Why do you use such a small drive belt. Does it not stretch / contract under load and chage the disc speed, or are you relying on 'flywheel mass effect' ? It gets a bit stretched just at start up (~1s) but after that it's not a problem and i actually think it helps to put less strain on the DC-motor. I normally only run the disc at 60-80rpm and have found no problem with the small size of the drive "belt" - but it's an easy change if there should be one in the future. Just my ignorance but how does one get the radial starburst? Do you set an angle and then rotate on? Do you set angle and then push on and off then rotate off? What happens when case has more of a curve to it? The cases I have done all have a flat surface for the sunburst pattern. if you have a curved case the procedure becomes a bit more complicated as the fixture then has to follow the curve of the case in some way - nothing I have tried! Why did you not try to use your lathe in the first place? Ok, you use it a lot otherwise but that might have been my first try. My lathe can take a disc of maximum 240mm and I wanted 300mm to get the "scratches" as straight as possible. I have just started to experiment with DIY anodizing of aluminium - will perhaps ad some colour to the machine in the future! Wow just love your work. Nice results too. Stumbled across this thread and I must say this is very cool! Great ingenuity and engineering skills, fantastic results too. New discs with 120 to 600 grit has finally arrived - so will try to lapp some more cases soon! 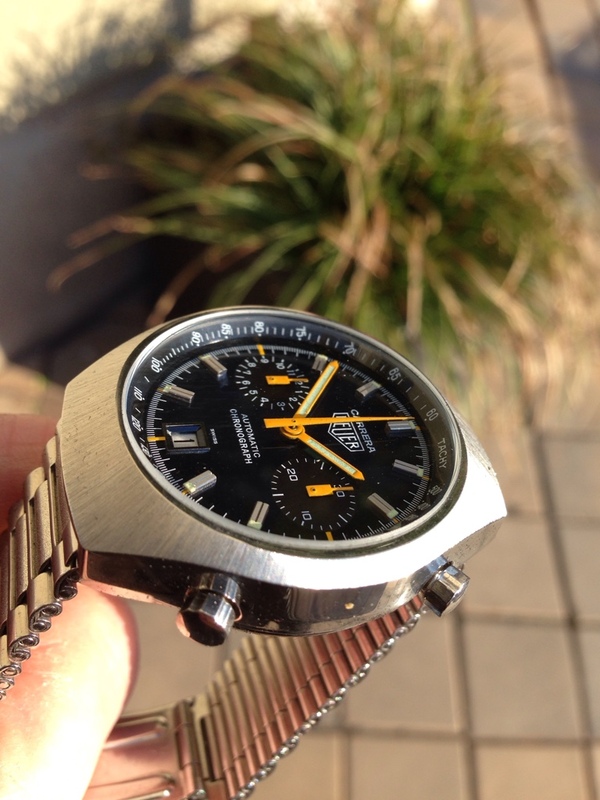 Here is a Heuer case that was quite messed up from the start - I had to remove some dents. Last edited by McGyver; 6th May 2015 at 13:40. That heuer looks great, very crisp edges and nice graining. That's a great skill to have particularly as you assembled what you need yourself. There is no way I would ever do this myself (lack of machinery and skills!) but your work looks great. Well done! You could try truing the disc in situ by mounting a lathe tool on you table. It had "dented corners" due to being polished a few times to many - did not want to take of to much material so left them as they are! Last edited by McGyver; 3rd September 2015 at 08:42.